Sunlight was fading fast. He had precious little time until the soldiers noticed his infamous pirate ship anchored just offshore. Boosting himself over the balcony wall, he was relieved to see his love had received his signal and was waiting rather anxiously. There wasn't a moment left to fret about her answer. He took a deep breath and withdrew the engagement ring from inside his captain's coat. "Will ye be me wench?" the pirate proposed. 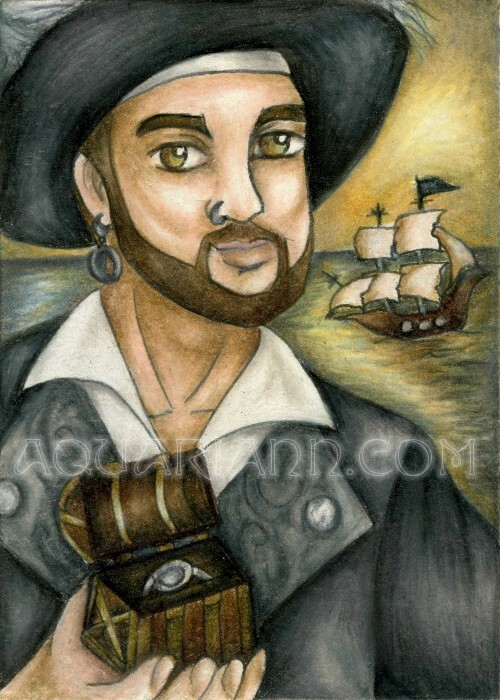 Pirate ACEO inked with black Sakura Pigma Micron Pens and colored with Prismacolor pencils onto Strathmore Smooth Bristol Paper. Wow...this is stunning..brilliant work..I love it! !Beautiful...he is such a charming soul! Great piece, love the little story to go with it, made me smile! Oooh aggrrrhhh she replied (which is yes in pirate speak), then she hitched up her skirts jumped over the balcony and they sailed off into the sunset together! What a wonderful story of Pirate LOVE! He looks very happy with his choice of rings, too! I am so amazed that this is an ACEO, so much detail! Great piece...Thanks for joining in Sunday Sketches today - Great to see you! Enjoy your day! Awesome, Kristin. Your own pirate must love this one. This has turned out wonderful. Love his expression!! beautiful work, and sooo romantic! Thanks for sharing. The ship and the colours of the sky in the background are a nice touch! How romantic, LOL. I really like the simple, muted color scheme. Pirates are so fun! Yours has such imagination and great detail! Love this! Just Pinned it. What a handsome rogue. She says yes of course! Handsome pirate and I loved your little story for this. Cute story, but this kind of looks like it was drawn with crayons ... anatomy and detail could use a little work too . But it's cute . Thank you for all the comments! I may not reply directly, but I do treasure each one. "Anonymous" - if I could get crayons to blend as well as colored pencils, I'd use them. That would certainly save me some money on supplies. Anonymous here - what brand of color pencils are you using ? If you want to save money and get better quality - don't laugh - buy Crayola . I swear . I've tried, and inevitably given away, hundreds of dollars worth of expensive, fancy color pencil sets because they just don't work as well as Crayola . I'd experiment with multimediums too . Watercolor looks really dreamy when paired with color pencils ... you might want to give that a shot . As far as the blending goes, a little really goes a long way . Try not to overblend - especially on the fleshtones with color pencil - because the colors will look too muted . I don't even blend with color pencils anymore because the beauty of pencils is that you can do amazing stuff with crosshatching that you can't do with other mediums like oil paint or pastels . Which, considering your style, you'd probably find easier to use and more satisfying when it comes the end result . You've got the right idea though ... I've seen your art a few times on Craftgawker and I like your style, you've got a really interesting vibe . Just thought I'd give a fellow artist a critique . After all, you can't improve without a little criticism ! Thank you for your thoughtful reply, Anonymous! I have to admit, your first left me a bit miffed - but I'm glad you came back to clarify your opinion. I'm excited that you found me through Craftgawker - I've become quite addicted to that site. Do you ever submit any of your own art to them? How beautiful! You have amazing talent. Wow. Stopping by from the Stop and Stumble Saturday Blog Hop.... I stumbled this! Love that art work. I wish I could draw, but I never migrated beyond stick figures. Oh, I love this pirate! just great!